If you haven’t heard, it’s emerging to be national news. 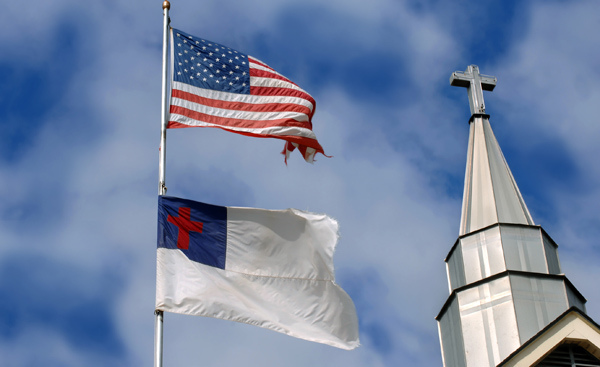 Some churches have decided to display the “Christian” flag above the American flag for the purpose of communicating their displeasure with sinful American culture, their declared priority of putting God first in their lives, and to “get the attention of the church” to realities such us their belief that God comes before government. As you might guess, this has not been well received by many. So now, we have flags flying over flags. That will teach them, right? That will show them “we put Jesus above all else” We’ll will demonstrate to gay people and everyone we are against, we ain’t moving from our superiority and the showing of our super-faithfulness to Jesus. Make no mistake, Jesus is our priority. Raise that flag! I find it interesting that Peter (in the Bible) once boasted of his priority for following Jesus over and above everything else in his life. He raised the flag and boldly declared Jesus as His all and all, that his priorities were God, then country, and then family. No one was going to stop Him or His love for Jesus. Well, how did all that flag raising play out for him? He ended up denying Jesus, not just once, but “three times a lady.” Oops… that turned out to be more like a flag crash-and-burning… how unpatriotic. See, when we raise our “doing” or “believing” or “faithfulness” as the essence of our faith, somewhere along the way, like Peter, our performance breaks down and we are shown for the religious hypocrite we are. Even if our religious eyes refuse to see it. Christianity is not defined nor best illustrated by a flag, and especially not by a flag over another. Sadly, this is rather the perfect symbol of the performance-driven, religious-spirited, elitist state of much of modern Christianity, where in the face of growing cultural disagreement and tension, our deepest reaction is to dig our heels in and further serve and heighten the defense of our religious system rather then to further serve, love, and defend the people who we believe are enemies of it. Yes, Jesus put the serving, loving, and defense of people (especially his sinful enemies and those against Him) over and above everything, even Himself. That’s the model. Hello… hello… is this microphone on? If Jesus is a flag, God lowered it, put it under, that people might be raised. That’s why Jesus is best displayed not in a flag risen over another but in Jesus, who did not consider His equality with God as over and better than another, but became a servant; humbling and lowering Himself to be crucified on a cross. He came not to be served, but to serve. And make no mistake, it was this Grace, pure Grace, that God resurrected and named as above all things; especially our self righteous, “faithfulness” flag raising. That every knee, especially the religious, would bow to Grace. Yet, much of modern Christianity is so vehemently concerned with being served by America instead of serving it. Having spiritual performance raised above Grace, and self-righteousness above Christ-righteousness. The house of cards that has become much of modern Christianity exposes its true self most clearly in the raising… arguments, voices, noses, flags, faithfulness, battle cries, self-righteousness. Christ showed Himself, His true cause, and His true ways in the lowering… serving, humbling, loving, listening, dying, giving Grace in all and to all. While some call for the raising of a so called “Christian” flag above the America one, God lowered the “Jesus” flag, put it under, that all people be raised by Grace through faith and His followers seek to serve rather than be served. Following Jesus is in the lowering, not the raising.